An outstanding resource for educators, Teaching Music Through Art will help your students understand the ways that music and the arts reflect our culture. Reproducible student pages are included, making lessons a snap to prepare, keeping students actively engaged, and allowing for easy assessment. 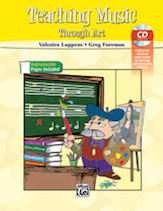 The accompanying CD contains listening examples of works by great Classical composers to support and reinforce the lessons. By increasing critical and higher-level thinking skills with winning, creative, ready-to-teach methods, Teaching Music Through Art will help your students meet item 8 of the National Standards for Music Education ("Understanding relationships between music, the other arts, and disciplines outside the arts"), making it easier to achieve, more accessible, and a natural progression for the student and the music teacher. Grades 2-6.